NEXUS draws upon the education and experience of its five members – among them doctoral, master’s, and baccalaureate degrees in music and education, combined with decades of involvement with schools and teachers in creating educational programming that is designed to communicate joy in the power of music to bring people together and to connect ideas. Sample 3 – Orchestra Community Residencyo Days 1 & 2 – NEXUS rehearsals and subscription series concert with orchestra. The program featured From me flows what you call Time by Toru Takemitsu. Also on the program were two solo pieces performed by NEXUS – Music for Pieces of Wood by Steve Reich and Tongues, based of the music of Zimbabwe. 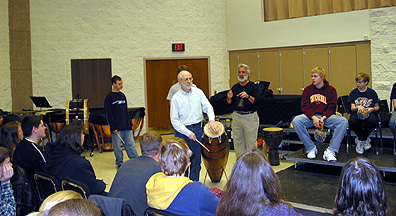 o Day 3 – NEXUS workshop on “West African Drumming” at a state chapter of the Percussive Arts Society’s Day of Percussion . o Day 4 – NEXUS performs a National Public Radio interview before a live studio audience. o Day 5 – two NEXUS Arts-in-Education School Programs for grades 1 through 5.
o Day 6 – Education concert at a community Music Center for students, parents, and teachers. o Day 7 – Two afternoon NEXUS symphonic education concerts with Orchestra – “The Story of Percussion in the Orchestra” and an evening Family Concert.